The gunners faced Tottenham Hotspur on Sunday and it ended as a memorable day to most of the Arsenal fans, coach and the players because they came out of the North London Derby as victors in a six goal thriller. 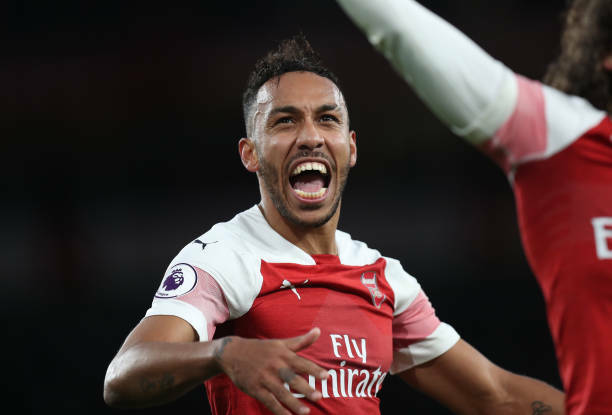 The whole Arsenal team impressed but Aubameyang made more impact because he scored a brace to become the Premier League top scorer so far. Aubameyang scored Arsenal’s first goal of the day in a spot kick after the gunners had received a penalty in the first minutes of the game, things changed in about five minutes and the gunners found themselves trailing by one goal but the Gabon international was again on target as he sent in a great shot which left Hugo Loris in despair as he just saw the ball roll to the back of the net. Matteo Guendouzi also played a few minutes in the North London Derby and the club has released a video which shows the young Frenchman kissing the boot of Aubameyang as a sign of appreciation for his performance against Tottenham Hotspur. Aubameyang will be hoping to win this season’s Premier League golden boot and he is so far doing well with two goals ahead of Eden Hazard. He will be hoping to get on the score sheet on Wednesday when the gunners make a trip to Old Trafford.